Lightening the tone a tad from this week's Donal MacIntyre encounter, today we say “hello” to the Paralympics with a chat with Britain's greatest ever sprinter, now coach and Des O'Connor-beating family man, Linford Christie. But first, a word from his sponsor: “Linford was commissioned by Currys and PC World to create an exercise training video for store colleagues motivating them through a summer of epic sporting events and therefore strong TV, tablet and laptop sales. www.currys.co.uk / www.pcworld.co.uk”. This kind of renders our first question redundant, so you may want to move straight on to the tech stuff. T3: First and most essential question, what are you plugging? 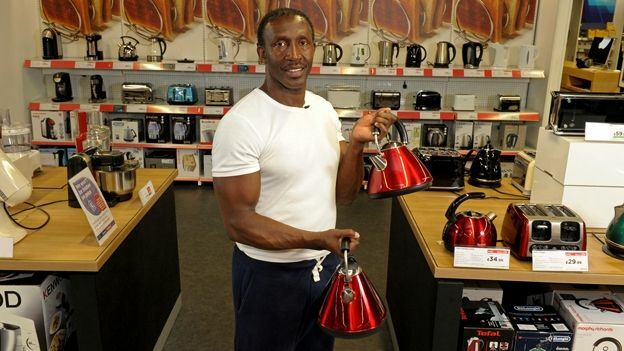 Linford Christie: I'm in PC World, you know, in Currys, they brought me in to try and raise the fitness level of their staff so they can be prepared for all the TVs they're going to be selling during the games and everything else, you know they've got to lift big fridges up and stuff, you know, they've got to be strong. T3: Have you been working on their speed? Upper body strength? LC: Both: speed, upper body strength, leg strength as well because they've got to pick up 60 inch TV's, you know. T3: Obviously you're retired from running, do you still work out all the time? LC: No, not at all, I don't work out as much but I do work out three days a week, maybe sometimes 4 at the moment during the season… I'll do the long runs with the guys, I do all the weight sessions so I've been doing maybe six days a week. T3: So just six days out of seven. Do you still run competitively at all? LC: No not at all, no that's all done and dusted, you've got to know when to quit. T3: Do you have kids? Have you ever turned up at the school sports day? And do they have a parent's race at the sports day? Have you ever thought of doing that? LC: I have, but just for fun. I've actually raced Des O'Connor. His son went to the same school as mine. T3:Well we hear he power walks a lot. Surely the other parents seeing Linford Christie lining up for a sports day parents' race must be like some kind of nightmare scenario? LC: Well I don't really do it to be honest. I take part in maybe a football game, maybe 5-a-side or doing obstacle stuff but yeah to go there and do the 100 meters, it would be totally unfair! Even though I'm much older than 90% of them. T3: You totally should do it. Are you into tech? LC: I'm trying to be! I've got to keep up with my kids. I do the apple thing, you know, you've just got to do otherwise I can't help the kids with their homework or do anything. LC: Aw definitely, It is very technical, I mean even the tracks they run on, they've got the surface set up and they'll make sure the fibres are going one way – it's faster if you run the longer way than if you run the other way. T3: So if you run left to right, a top athlete would actually go faster than right to left on a track? LC: Exactly, some tracks are a bit harder than others which means you're going to get your speed down a bit; some are soft so the distance runners could benefit, there's just so many things! I mean they can make tracks faster, but back in 1991 they made a track in Tokyo which they've since banned because they said it was too fast! T3: Is there a track in the world which is seen as being the fastest then? Somewhere where if you're looking to break a record, that's the one that you would head for? T3: Obviously the Paralympics has just started, but in the Olympics we had Oscar Pistorious, a 400m runner who uses, if you will, “enhanced” legs. Could you see in the future that sort of bionic enhancement of athletes being something we'll see more of? LC: Well, I mean, of course as the technology grows people will move with that, and that's the way it's going to go, it doesn't mean everyone will have the same technology, like racing cars, you can tweak yours and do this and that, and eventually they're going to have to limit, put some restrictions on how advanced the tuning of your legs can be. I could see it going that way. T3: You could see in, say, 100 years time a race of bionic men lined up against each other, almost a race between different countries' technology as much their athletes? LC: Yeah definitely, I mean it'd be like Robot Wars, it'd be like Real Steel where they've got the robots that they fight mechanically. That'd be good. I think the Olympic ideal has changed,:it used to be not the winning but the taking part, now it's all about the winning. T3: How old are you? T3: Gosh, well okay, assuming they had technology when you were young, what was the first gadget you were bought or given as a child? LC: As a kid, I had a couple of games consoles of course, as always, we had the little thing were you press the button and the little man jumps from side to side? T3: Like a Nintendo Game n' watch? LC: Yeah, that's the thing! I had one of those. Yeah and one of those little wind up horses! LC: You remember when you were a kid and you had one of those horse you'd wind them up and they'd just run across the floor! T3: So like a wind up car but a horse? T3: Was the idea that you had several of them and raced them? T3: Oh okay, I was thinking that might be where your love of running might have come from, from racing wind-up horses across the lounge as a child. What Game And Watch was it? LC: Donkey Kong. It was great. You think about it and for the time it was pretty advanced. I mean as kids we thought we were ahead of everyone else, we had those little watches, those little Casio watches, with calculators on it and everything. T3: What's the most recent gadget you've bought? From PC World, of course. LC: The other day I just bought a 60-inch smart TV. An LG one, with the smart remotes. You can get the internet on it, it can do all these things, its got a Freeview button and everything else like that. T3: Do you use all the smart TV stuff? The catch-up TV and what have you? LC: No because, you know, I don't really watch TV that much to be honest with you. I mean, I watch Question Time, but my kids control the TV completely. They want to watch all their programmes and everything else… I'm sort of second class now. T3: You mentioned Question Time… Stereotypically you'd assume a former professional athlete would spend all their time watching sport – do you not do that? LC: No I'm not a sports person at all, if I'm honest. I can watch the highlights of the football and everything else but I'm not really that big a fan of sport. I only watch athletics when I know the people that are competing, or if my athletes are competing, I'm trying to see how they perform. The strange thing is, I have Sky Sports at home and I had it for a while but it was only for when my mates came round that I even realised I had it. It can be overkill you know? LC: Nah, I mean, when you're bored and you're in a country where, the TV, it's not in English, I guess you can sit there and you'll watch anything at all, you'll watch CNN or football or anything else. That's about it. T3: What is your favourite gadget of all time? LC: It's got to be the iPad. I had the first one; now I've got the second one. The one with the camera on it. T3: You're not tempted to upgrade to the Retina Display third one? T3: The third one has got what's called a Retina Display, it's more high res. LC: No, I'm not tempted by that at all. One of the reasons I love it so much is that when I go abroad I can Skype my kids, you know. You can see them and when you're travelling you can play the games and do all that kind of stuff, you can take pictures on it, get directions from it and everything else. T3: Which games console is the best? LC: It's a toss up you know, It's between… I mean I've got them all, I've got the Kinect, love it, but at the same time the Wii is pretty good, you can get more people involved and everything else. I think those two are equal, partly because you can get the kids and everyone else doing some exercise and having fun at the same time. With the Kinect you've got to have space, if you have space it's perfect for you. But you've got to have space. LC: (Laughs.) No I'm just half blind! T3: The telly must be really looming over you if you have a small lounge. You're in danger of being crushed if it falls over. The next one, iPhone or Android? LC: I have the iPhone, I love my iPhone. Love it. I've never been tempted to down the Android road because, if I find something I like, you know… I used to be a Nokia guy then after I got an iPhone and now I'm stuck on it because you learn to use it and it's so easy. T3: Do you use it mainly as a phone or do you use it more as a source of entertainment? LC: I use it for the internet, I'm not a really big downloader as such, but it's got everything on it that you can download or if you want to find out when the shops open or anything else you can do that, or when I'm coaching my athletes I can film them so they can see their technique and everything else and I find that quite neat. T3: If you could make a gadget, what would you make? LC: That is such a good question! What would I make? I would make something I could use for training so I could time all my athletes and everything else at the same time you'd be able to take pictures and just anything that would help me improve their technique, let them know how fast they're going. T3: So something that would analyse their running technique, their gait as they run, that kind of thing? LC: That's it… Give you all the data that you can print out that you need from it.